All sandwiches, paninis and wraps include your choice of crispy fries, homemade Red Bliss potato salad, or homemade coleslaw. We always have Chicken Noodle and Tomato Basil. 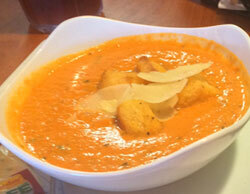 See our “What’s Fresh Blackboard” for this week’s soups. Hand breaded antibiotic-free chicken breast dipped in a spicy oil & served on a bed of coleslaw, pickles and comeback sauce. 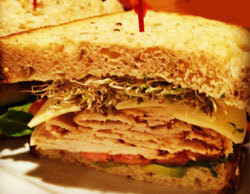 Sprouts, avocado, lettuce, tomato, provolone cheese and avocado aioli with sliced turkey on 7-grain bread. 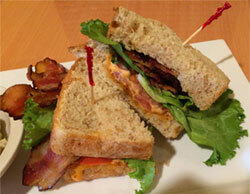 Crispy bacon, lettuce, sliced tomato and chipotle mayonnaise on freshly baked honey wheat bread. Served with chipotle mayo, lettuce, tomato, pickles, cheddar & Swiss cheese on grilled multi grain bread. Our homemade crab cakes made from lump crab meat on a kaiser roll with lettuce, tomato and rosy tartar sauce. 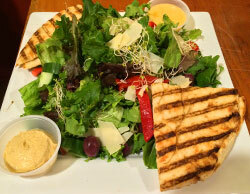 Dill chicken salad or albacore tuna salad made from scratch & served on a bed of lettuce & sliced vine ripe tomato. 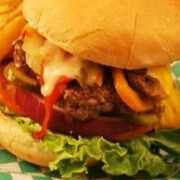 Fresh-ground, hand-formed 1/3 pound burgers, grilled juicy and served on a grilled bun with lettuce, tomato, onion and pickles. 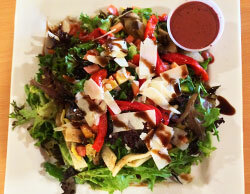 Served with your choice of crispy fries, homemade Red Bliss potato salad, or homemade coleslaw. Grilled burger topped with cheddar cheese, bacon, fried egg, chipotle mayonnaise, sliced tomato, lettuce and pickle. Grilled chicken breast topped with mozzarella cheese, Parmesan cheese, sliced tomato and pesto on ciabatta bread. House-roasted shredded pork, sliced ham, Swiss cheese, yellow mustard and a jalapeño pickle relish and served on a toasted hoagie. SALAD DRESSINGS: Lite ranch, house made Green Goddess, scratch-made honey bacon Dijon, blackberry honey mustard, blueberry balsamic vinaigrette, citrus vinaigrette (gluten-free). Our mixed greens with apple slices, layered with antibiotic-free roasted turkey, topped with fire-roasted tomatoes, artichoke hearts & alfalfa sprouts. Drizzled with our house made Green Goddess dressing. Mixed fresh greens, grilled free-range chicken, strawberries, blue cheese crumbs, walnuts and tomatoes with blueberry balsamic vinaigrette. Hand breaded antibiotic-free chicken tenders on mixed field greens, cheddar cheese, applewood bacon pieces, diced tomatoes, cucumbers, sliced red onion. Served with our scratch-made honey bacon Dijon dressing. Local roasted veggies of summer squash, eggplant, jicama, zucchini, peppers, tomatoes, basil pesto, Parmesan cheese served over a bed of mixed greens & drizzled with a balsamic glaze. Scrambled eggs, tofu, quinoa, peppers, onions, black beans & corn mixture, topped with pickled red onions. Served with your choice of side & homemade salsa. Berry Fresh Cafe housemade quinoa black bean burger, grilled and served on a brioche bun with lettuce, tomato, provolone cheese, cucumber, sprouts and avocado aioli with our homemade salsa on the side. Your choice of side. 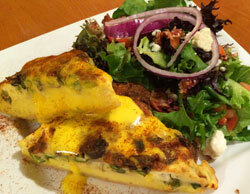 Our Quiche is made fresh daily! (Seasonal Quiches Available Subject to Freshness) Topped with homemade Hollandaise sauce and served with your choice of fresh fruit, grits, home fries or a small salad. 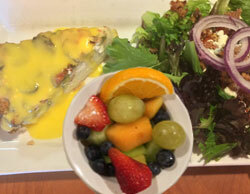 See our What’s Fresh Menu for Quiches of the Month.